Public and private sector representatives met to discuss the future of autonomous vehicle policy. Self-driving cars are coming, and along with promises of reducing pollution and congestion, they’re causing a lot of work for urban and city planners. Representatives of the ride-share industry, government representatives and urban planners met for a conference on self-driving vehicle policy on Sept. 19 at the Mercer Island Community Center. Dr. Anne Brown, an associate professor at the University of Oregon where she studies technology and urban planning, said there are four main areas she is concerned with: land use, curb space management, parking and the revenue implications for municipalities. One of the biggest impacts autonomous vehicles could have is reducing the need for parking, not only in public places, but in homes and apartments. In the near future, single-family home owners with a garage may opt to use self-driving car rideshare services, freeing up their garage to be converted into a “mother-in-law unit” or rental unit. On city streets, massive amounts of space reserved for parking could be converted into other uses. Some parking for self-driving cars would still be needed, and city planners should think about where these could be placed, Brown said. Vehicles in the U.S. are parked about 95 percent of the time, and if fewer people relied on single-occupant vehicles to get around it would unlock huge amounts of space in urban areas. “Without that, it releases all this space to be re-imagined,” she said. It also could impact retail. Companies like Domino’s are already using mobile kitchens in vehicles to bake pizzas, this could expand to other industries, like hair salons, Brown said. Additionally, whereas most retail businesses use a single warehouse for distribution, self-driving cars could prompt them to disperse to multiple, smaller locations for easier delivery. For housing, if commutes are more enjoyable it could lead to more urban sprawl as people opt to live farther away and deal with more travel time. Services like Lyft and Uber already are looking at moving toward electric self-driving fleets, which could reduce the number of car owners paying both car tabs, parking fees and gas taxes. Municipalities will need to find ways to deal with a decrease in revenue, Brown said. Shannon Walker, the Seattle Department of Transportation new mobility strategic advisor, said the city is struggling to meet a growing transportation demand. They are making improvements at transit hubs by creating electric vehicle charging stations, shared parking spaces and pedestrian improvements. Their goal is to encourage carpooling instead of people buying their own self-driving cars in an attempt to curb traffic. A common criticism of self-driving cars is that the technology could lead to a phenomenon known as “zombie cars,” where owners who don’t want to pay for what will likely be higher parking fees would have their cars circle and wait for them, increasing traffic congestion. One way to deal with this would be to create a mileage fee that would penalize drivers who try to avoid parking fees. Labor impacts will be felt most acutely for people who drive for a living, including truck, taxi and gig economy drivers, many of whom could be out of a job within a decade, Walker said. Cities should be planning ways to help retrain drivers. “We also need to be realistic on the impacts it can have on our residents,” Walker said. The cities of Bellevue and Kirkland already have begun looking into using autonomous vanpools in the near future. Steve Marshall, Bellevue’s transportation technology partnership manager, gave an overview of their CommutePool program, which was previously covered by the Reporter. Employers in the area have been growing more concerned with traffic gridlock, which forces moderate- and low-income workers further away from their jobs in urban centers, leading to longer commutes and more traffic. Bellevue School District loses nearly one quarter of its new teachers each year due to the high cost of living near where they work and the long commutes from places they can afford to live in. Bellevue and Kirkland are working with Amazon to develop an app that would let commuters book rider-shares in autonomous vehicles. The autonomous vehicles coming to Bellevue will have human drivers until the city is confident the vehicles can perform safely under any situation. The vehicles themselves will be operated and maintained by their manufacturers, which could include major car manufacturers like Ford or Nissan to tech companies like Google. 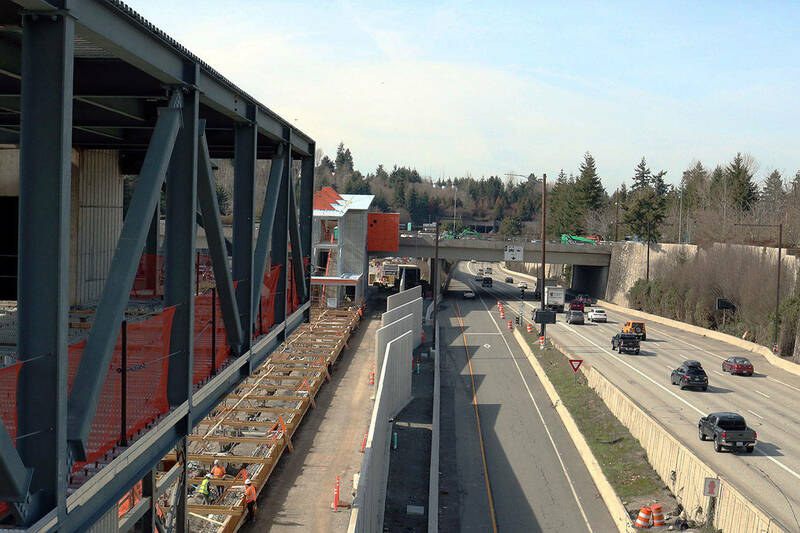 If the program is successful it could be expanded to provide rides for 3,000 commuters along the I-405 corridor from Auburn to Kirkland.